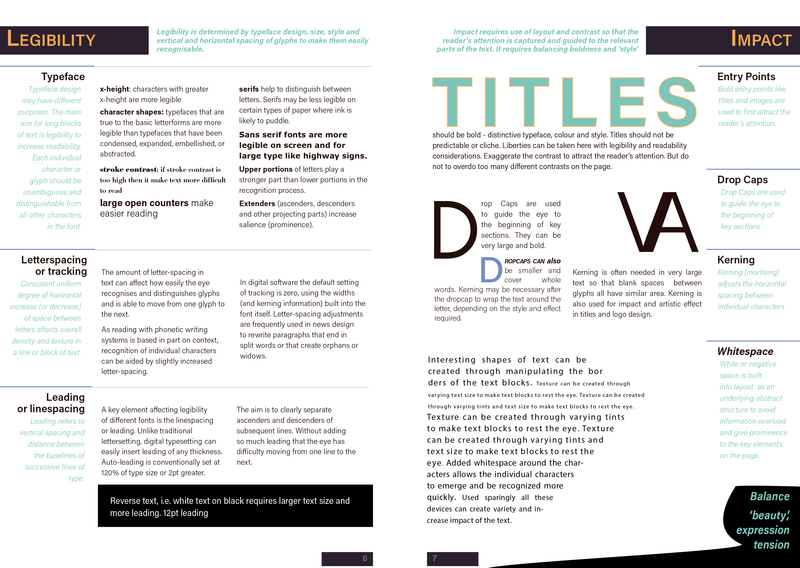 Create two books explaining and exploring the typographic principles you have researched in this section. Your books should each take the form of a simple eight-page booklet – folded, stapled or stitched. Design the cover and contents for each. Keep notes to accompany the making of each book in your learning log. These notes should cover why you decided to portray what you did, what you included and what you omitted. 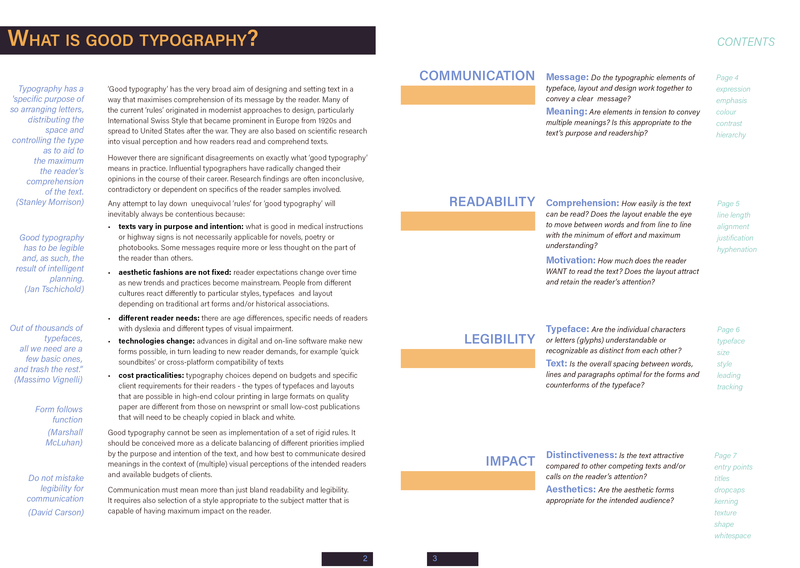 Using the reference material that you’ve gathered throughout the exercises and research points in Part Three, design a book which explores traditional ‘good practice’ in typography. 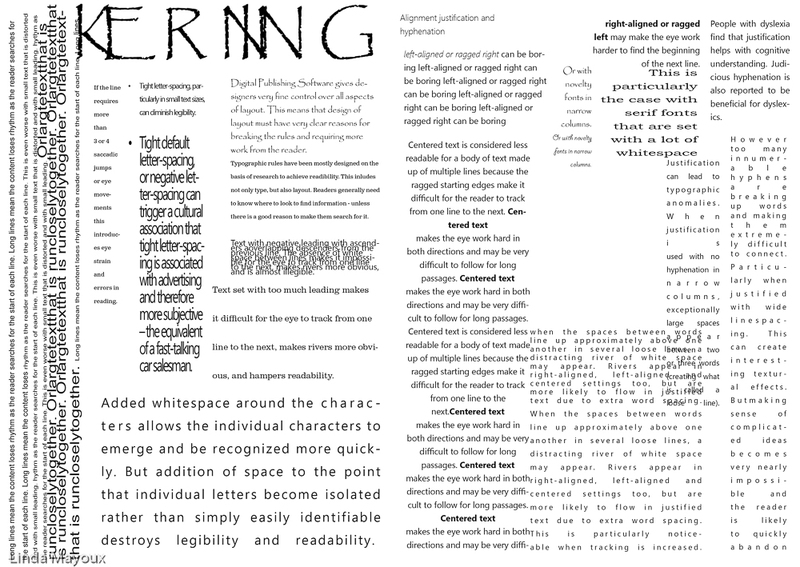 What is readability and, as a designer, how can you aid it? Visually explain the typographic principles that we’ve touched on in Part Three, such as type size, leading and line length. For example, you could demonstrate kerning by creating a page which looks at letter combinations applying this principle. This final version significantly changes that originally sent to my tutor in terms of overall design, and reordering content to start with communication. It followed a number of explorations and further research on definitions and interpretations of Good Typography, International Swiss Style , Typography InDesign and African Graphic Design. But I still feel I have only really scratched the top surface of good typography. I need to learn much more about the underlying visual dynamics of abstract layout – textures and balance of text blocks on the page. And look at more innovative ways of consciously breaking the rules for a specific purpose rather than for the sake of experimentation per se. 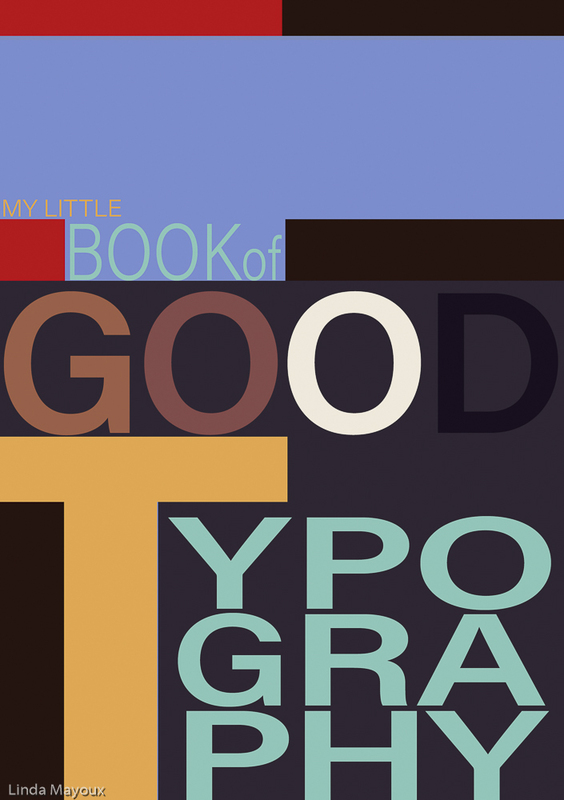 Some more interesting approaches can be found in the discussions by Chris Do on Good Typography. But I need a lot more experience and time for experiment. The first version 1 as sent to my tutor was not very successful. Although the content of discussion is broadly fine and it taught me a lot about InDesign, the design was very bland and boring. Particularly the covers and the text boxes on page 3, and the fragmentation on p6. These have more drama and colour. Version 2 got rid of the text boxes, re-ordered content on p6 so it was less fragmented and made the covers more interesting. Version 3 uses the same layout but with process colours, following some designers in International Swiss Style. I like the colour version more, but still rather old fashioned and boring. I had been collecting examples of African graphic design as part of my work. Although I have not found anything truly exciting in terms of layout design, what was interesting for me was the colour. So I looked up different colour schemes in Adobe colour, on the Internet and from my own material (See African Graphic Design post). 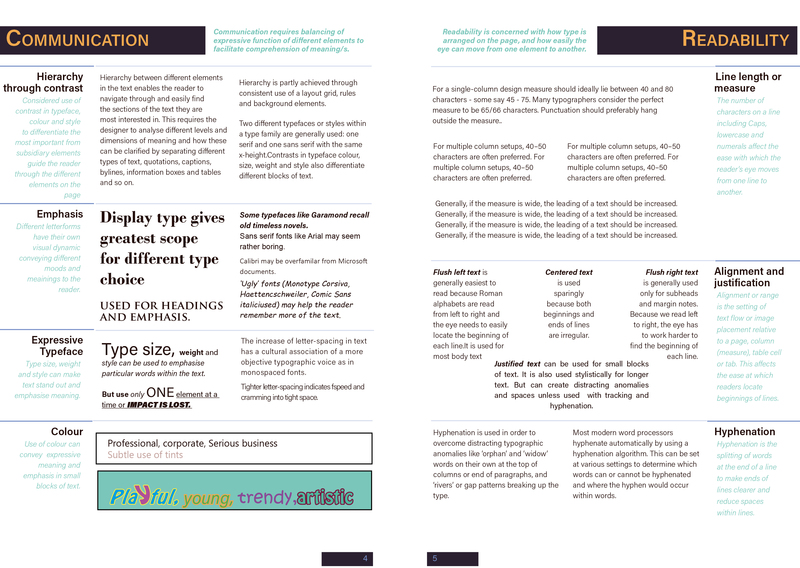 I replaced the introduction with a double page information graphic experimenting with InDesign rules and lines – but it kept crashing so I could not go too far with this – it needs Illustrator and time. A second substantive change was to put communication first and reorder the pages. This gives a much nicer flow, as well as better conceptual emphasis. I like the coloured pages, but a bit over the top for this particular publication, and would need a very good printer and paper. My inkjet printer does not like duplex printing on thick good quality paper. The final version was a hybrid combining some of the layout and colour of the African version, but toning it down and bringing back the first page text. I think this version is much more successful in terms of colour and balance on the page. But I am hankering for something a bit more innovative. Needs more work and looking at other designers. The rules surrounding what constitutes ‘good’ typography are entrenched in tradition and convention, as you demonstrated in Book 1. Having looked at ‘the rules’ surrounding readability and legibility, now is your opportunity to break them! 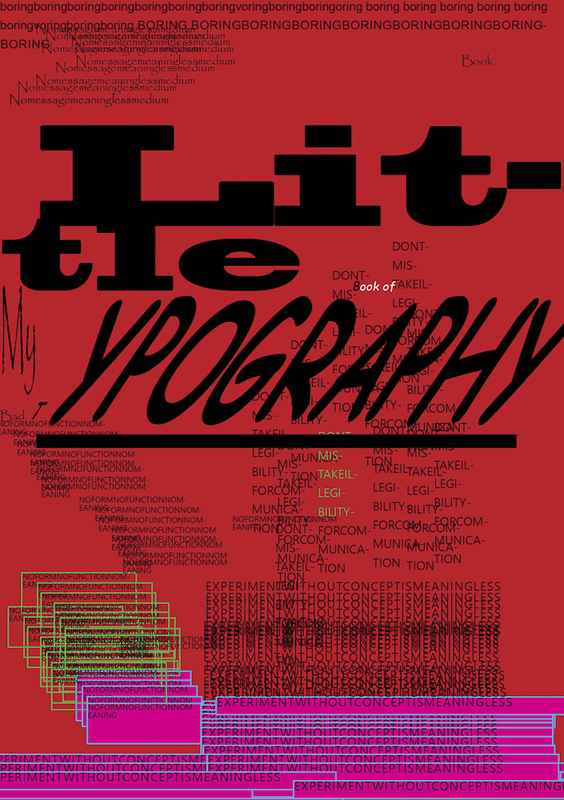 Be inventive and experimental in how you explore what might constitute ‘bad’ typography. For example, negative leading, too-long line length and ‘inappropriate’ application of typographic principles may produce visually jarring and uncomfortable results. 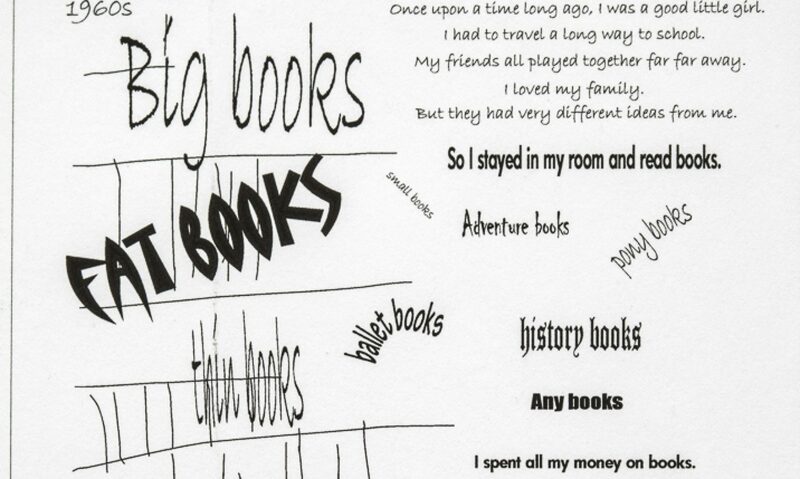 What does ‘bad typography’ mean to you and how might it manifest itself? Express your ideas in a visually imaginative way within your second book. This part of the assignment was as difficult as the book on ‘conventionally good’ typography. Modernists might see almost any expressive typography in some senses as ‘bad typography’ in a conventional sense. 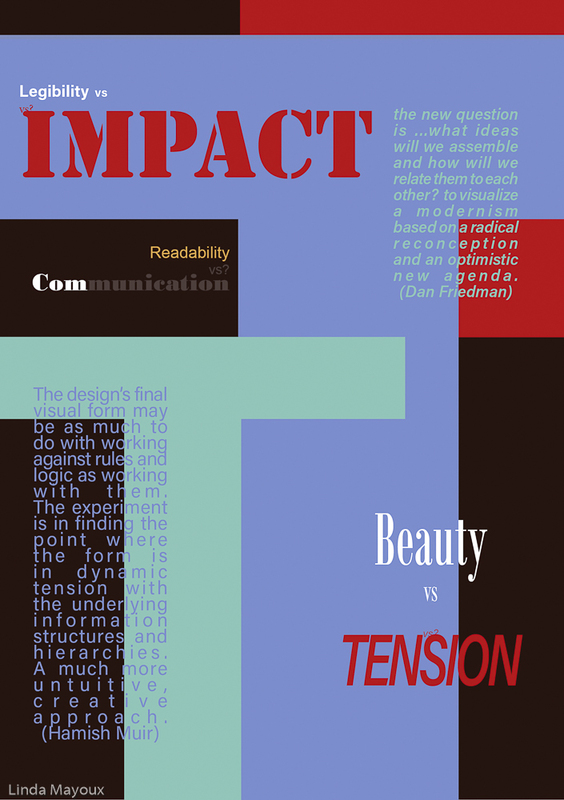 Converselely the task is in some ways tautologous because any ‘bad typography’ could be judged an expressive communication of the topic of the book – and hence ‘form that follows function’. So I did my best to produce the worst and most random ie unconsidered treatment I could without reflecting too much. My main point is that experimentation, playing and breaking the rules is necessary for new thinking. In order to go beyond just playing around it is necessary to have an underlying concept or meaning – however broad or complex and ill-defined – and to understand the rules enough to know how and when breaking them will enhance communication of the concept. Rather than just being unnecessary confusion and mystification that is likely to make even an interested reader give up the fight for comprehension. The first version of this booklet was more successful than the one on Good Typography (See Tutor Report BD3). Although many alternative possibilities exist for interesting experimentation I did few changes to the original. 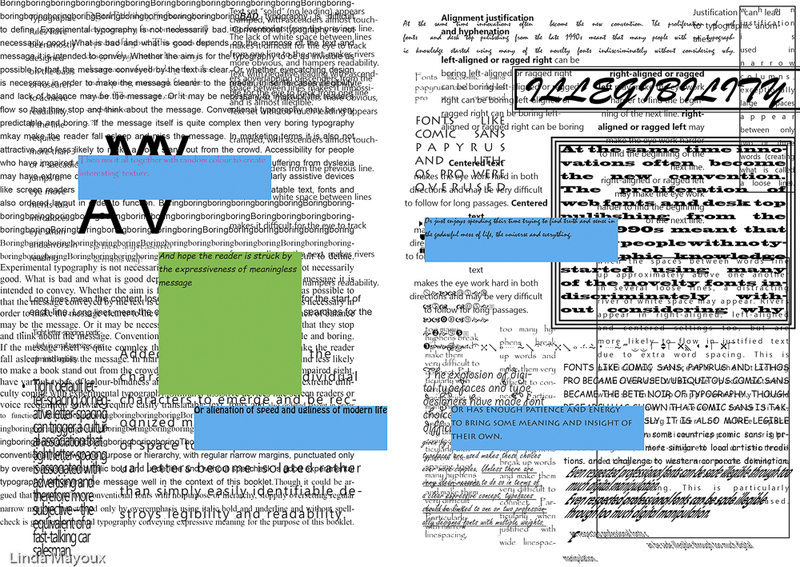 In the cover page I started by inverting or synthesising some of the quotations from experimental typographers in Teal Triggs ‘The Typographic Experiment’ and follow up research. For example David Carson’s ‘ do not mistake legibility for communication’ becomes ‘do not mistake illegibility for communication’. 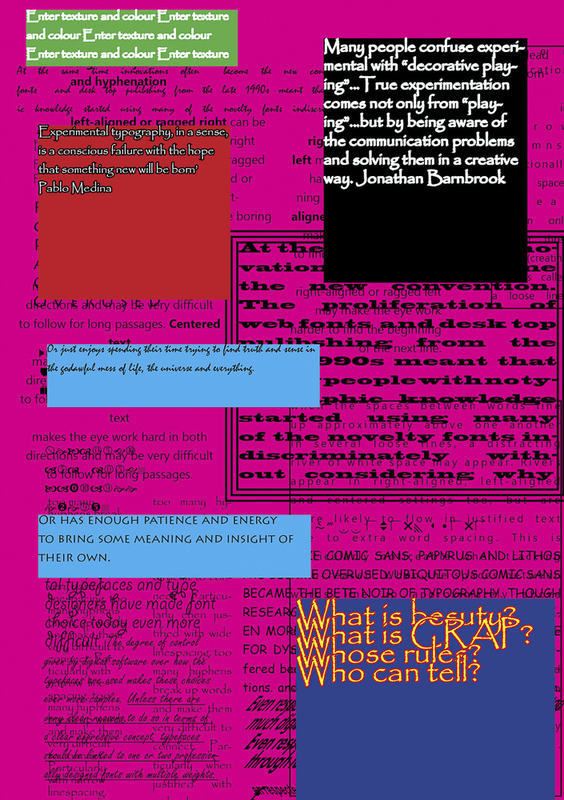 I then made the front cover as illegible and contradictory as possible without making it completely incomprehensible – though that would perhaps have been the logical but too risky implication of the task. Bad Typography 2-3 I decided to start the book with the idea that bad typography is boring – even things that can seem innovative at first become monotonous if repeated too often. I was particularly struck with my impatience in reading all the upper case text in Ian Noble and Russell Bestley’s ‘Experimental Layout’. I found myself just skipping the text and jumping to the images where the captions were easy to follow. An example of bad typography rather than interesting experiment – given that presumably the text was meant to be teaching me something other than frustration! Although I found David Carson’s work inspiring at first, after a while I just found it meaningless and repetitive of cliche. Page 3 then looks at all the random experimentation possible in programmes like Word – though maybe here I should have used Word itself and then copied jpgs into the file. As Word effects and type are much more random and meaningless on the whole than those in InDesign. Pages 4 and 5 then go into more detail on issues of readability and what helps or hinders it. Though actually I find the layout and abstract textural effects quite interesting as something to experiment further with. 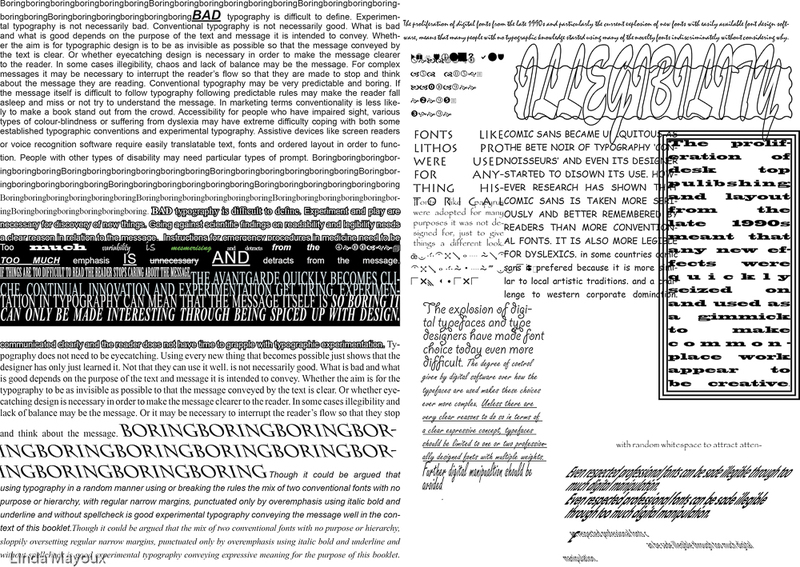 Bad Typography 6-7Pages 6 and 7 then put all those elements randomly together in a mish mash of overlaid effects. This is now pretty much illegible. Though again I do find some of the textures and random placement of coloured boxes interesting. Maybe each page could then be developed more as pastiche of ‘bad Carson’ or ‘bad McKoy’. I need more time to experiment and think that through. The back cover contains some concluding quotations I found useful by contributors to ‘The Typographic Experiment’ on what distinguishes experimental typography from ‘bad typography’. I tried to make the colours as jarring as possible, including a clash with the front cover. In general I want to do research on more experimental designers and look in more detail at what I find inspiring and what I find banale, meaningless and now cliche, and why. Then see how I can make really bad conventional and experimental typography. I feel at the moment I have only just begun to scratch the surface of something.